What does the "Campaign Level Blocking" feature do? This feature allows the user to block an IP address only for the campaign that was triggered. We will use a client that has two different campaigns, one for US clientele and the other for UK clientele, as an example. 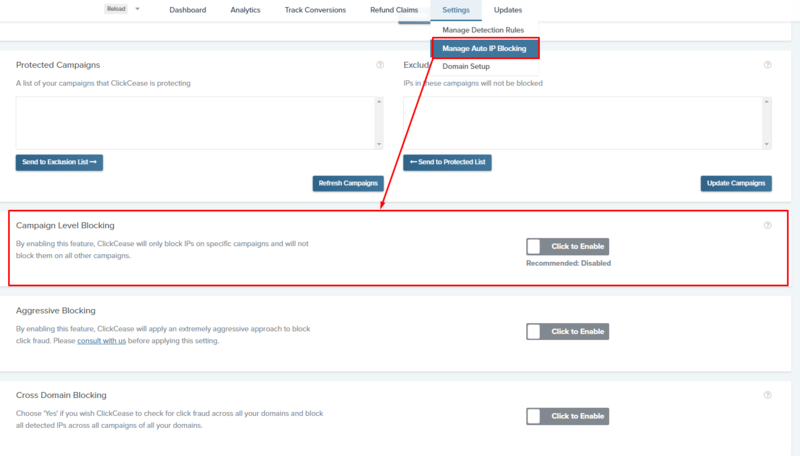 When this feature is set to ‘NO’ (which it is, by default), if a UK customer triggers the click-fraud threshold that the user has set (see Manage Detection Rules), the IP of the attacker will be added to the exclusion lists of both the UK and US campaigns. However, if this feature is set to ‘YES’, the UK attacker's IP address will be added only to the UK campaign exclusion list and not to the US list.